Without even seeing this film there is a lot to be surmised on the facts alone. Rampage stars The Rock and a giant gorilla, is directed and written by those responsible for San Andreas, and is based on a video game. Brace yourself for the horrors ahead. But this reviewer went in ignorant of those last two facts, expecting something that could potentially be a whole lot of fun. And really it is, even if it is essentially San Andreas meets King Kong. 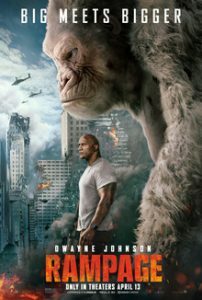 Dwayne ‘The Rock’ Johnson stars as Davis Okoye, a primatologist responsible for the care of an albino gorilla named George. When a genetic experiment goes wrong, George is transformed into a monster, growing bigger, stronger and more aggressive every minute. Add a wolf and a crocodile into the mix and it’s a fully-fledged disaster that only The Rock can fix, obviously. As the evil mastermind of the Energyne organisation, Claire Wynden (Malin Åkerman) and her dim-witted brother, Brett (Jake Lacey) try to lure the monsters for ultimate financial gain, Davis teams up with their disgraced genetic engineer, Dr. Kate Caldwell (Naomie Harris) to find the antidote and save the world. Completing the main cast is Jeffrey Dean Morgan as government agent Harvey Russell, who I spent most of the film thinking was Javier Bardem with an American accent. Rampage is directed by Brad Peyton, responsible for the hilariously awful San Andreas, and written by a team consisting of Carlton Cuse (screenwriter of San Andreas), Ryan Engle, Ryan J. Condal, and Adam Sztykiel. Whether it is will be quite as hilarious for general audiences is difficult to ascertain when you’re in a media screening full of critics who tend not to laugh at stupid humour. But it has plenty of eye-roll-inducing one-liners that are actually pretty funny when The Rock says them because, well, he’s The Rock. It’s also a film that appears to be more than happy to make fun of itself; it’s obviously not to be taken seriously. At worst, the dialogue is not great, especially in more serious moments when characters state the obvious (i.e. as the cage holding George starts to tear apart at the seams, Davis dramatically states “It’s not going to hold”) but we weren’t exactly expecting Shakespeare, were we? So does it break the video game movie adaptation curse? For starters, it seems that it was only loosely based on the series of games, in which the animals started off as humans, and its significant modifications are probably for the best. But you’re asking the wrong person really, because this reviewer knows nothing about video games. Based on the consensus that the fairly average recent Tomb Raider was perhaps the best of a bad bunch so far, I’d argue it’s probably on par. It’s not bad, but it’s not great either. Given it’s only loosely based on the game, Rampage is probably viewed better as a monster/disaster movie in its own right. No prior knowledge is required and the action scenes are certainly entertaining. In particular, the build up to the reveal of the crocodile is a highlight, and is best seen on the big screen. To the film’s credit, it’s racially diverse, has a sweet message about the bond between human and animal, and has villains that aren’t Russian. It’s mindless fun while we eagerly anticipate the upcoming San Andreas 2 (yes, it’s actually happening). Embrace the cheese.